Do you still hold on to the belief that whole-grain breakfast cereals , granola and muesli are a good choice for breakfast? Most people cannot imagine giving up their morning bowl of store-bought cereal. Here are some of the excuses I’ve heard; “But it is just so quick and easy” or “It helps my stomach stay regular ” and “I just love the taste and the crunch“. Yes, these cereals are very enticing and hard to give up because they are full of sugar (about 5 to 8 teaspoons of it per 30 gram serving). You might as well start the day with a can of Coke! Also, many people have more than the 30 gram serving because, lets face it, 30 grams of cereal is just not going to touch sides. You will be rummaging in the fridge an hour later. Are your perhaps one of those people who are trying really hard to be healthy? So you eat a big bowl of cooked oats for breakfast, with no added sugar. Well, sorry to burst your bubble. The carbohydrate value of that cup of cooked oats equates to around 13 teaspoons of sugar (and that’s with no sugar added). Remember, your body doesn’t discriminate between ‘healthy’ sugar and ‘unhealthy’ sugar. It’s just sugar. ALL carbohydrates get converted to glucose in your blood stream and it ALL goes through the same metabolic processes which play havoc with your health and your waistline. 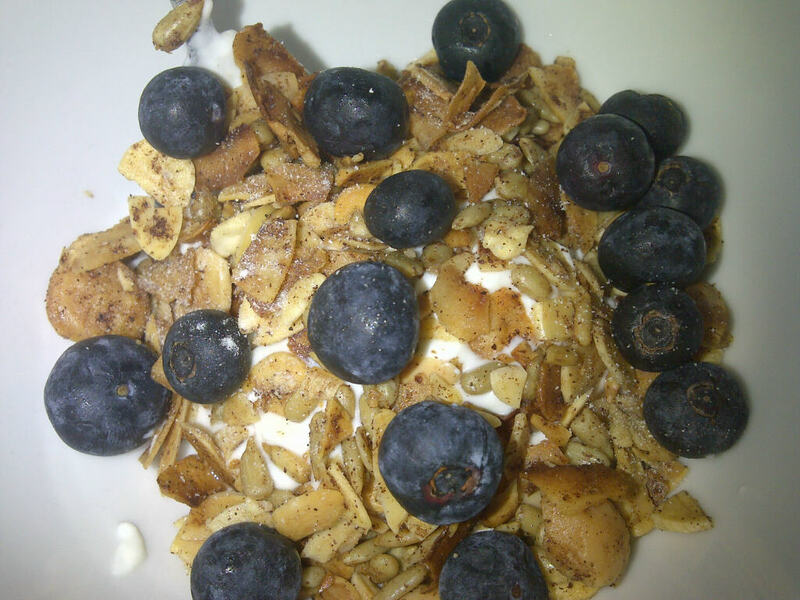 Breakfast cereals can really sabotage your efforts to be healthy and slim. They also don’t contain any substantial protein or healthy fat. These are the vital nutrients that keep you nourished and full for longer. So, is there an alternative which can give you the same taste and texture but without all the carbs, grains and sugar? Yes there is. The ONLY downside is that you have to make it from scratch. A small price to pay though for this absolutely scrumptious and healthy muesli. The recipe below was inspired by The Real Meal Revolution cookbook (which is awesome by the way). It is full of nuts, seeds and healthy coconut oil. It is really easy to make too. I have just tweaked it a bit for personal preference. Heat the coconut oil, spices and vanilla in a large pan or wok. Add the rest of the ingredients and toast for a minute or two stirring all the time to infuse the nuts with the spices and coconut oil. Pour mixture into a large baking tray and put into the oven at 160 degrees Celsius for 8 to 10 minutes. Once muesli is nice and golden brown, remove and cool on kitchen paper/roller towel. Store muesli in an airtight container. Enjoy with some almond milk or full fat Greek yoghurt and berries. You can also sweeten to taste with stevia or xylitol. Click Grain and sugar free muesli to download a printer-friendly PDF version of the recipe for your flip file. Read this if you need a refresher as to why grains are considered a very poor choice if your goal is to be in super-excellent health. And this informative 4 minute video clip Weight Loss Tip! Stay Away from Grains! Passionately sharing information about the paleo/primal, high fat/low carb lifestyle that will rock your world! I am on my own journey to good health and a slim body. My goal? To enjoy the ride as life on this beautiful planet is just too short to do it any other way. Posted on January 31, 2014, in Meal inspiration, Primal 101 and tagged Grain-free muesli, Paleo breakfast option, Paleo muesli. Bookmark the permalink. Leave a comment. I am on a mission to empower people with information so they can make informed decisions about what they eat. I am not a nutritionist (yet), dietician or a doctor. The information on this blog is purely for information purposes only. Are you doing low carb the right way for YOU? What’s the best time of the month to start a diet? Want to lose weight? Avoid these foods. Are you eating the right amount of fat?